If there is one place at the shelter where things never happen the same way twice, it is the veterinary clinic. With an average of 20 animals being taken care of each day, it is not surprising that RSPCA ACT vets and nurses have so many interesting stories to tell in between saving lives. 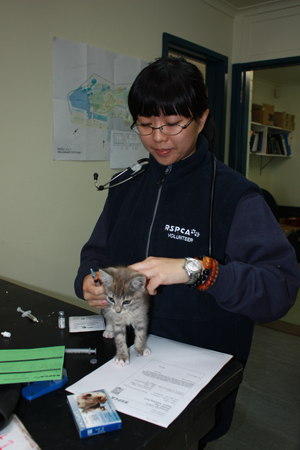 Having a veterinary clinic on site is a huge benefit for the shelter and plays an important role. By doing most surgeries and checks here at the Weston shelter, money is saved and used to take care of even more animals. In addition to vet checks conducted when animals first arrive at the RSPCA ACT, the vet clinic is responsible for de-sexing shelter pets to ensure they cannot reproduce and contribute to the overpopulation problem. 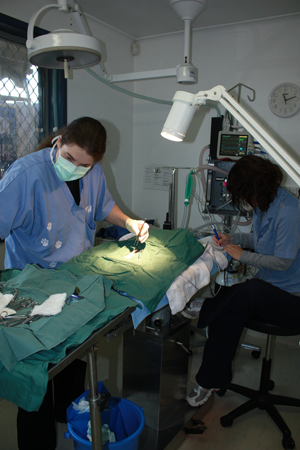 Surgeries for sick or injured pets and wildlife are also part of the routine. As well as providing an essential service for the shelter, RSPCA ACT’s vet clinic offers reasonably priced services to members of the community and in some cases assistance for those who do not have the necessary funds to pay full vet fees for their domestic animals. Asked about an example of something unusual that happened recently, Manager Jane Gregor recalls a surgery where a pair of jeans had to be removed from a bull terrier’s stomach…and the dog survived.